What is Vanishing White Matter Disease (VWM)? Vanishing White Matter Disease (VWM) is one of more than 50 conditions that affect the white matter, or myelin, of the brain known collectively as Leukodystrophies. VWM, also known as Childhood Ataxia with Central Nervous System Hypomyelination (CACH), is an extremely rare neurological condition that destroys myelin, the brain’s white matter, or myelin. In doing so, it permanently affects transmission of brain signals to the rest of the body. How does VWM affect the individual? VWM is chronic and progressive, and is unusual in that periods of rapid and severe deterioration can be caused by minor head trauma, fevers and even anesthesia. Although there is currently no cure for VWM, it is treatable. With proactive, comprehensive medical care the symptoms of VWM can be well-managed to give the individual the best quality of life possible. Symptoms generally appear in young children (usually between 2-6 years old) who previously had fairly normal development. The severity of the disease is strongly correlated to the age of onset. While every patient is different, as the disease progresses, individuals can expect some or all or the following symptoms: loss of motor skills (walking usually goes first, followed by ability to sit unassisted, speech, use of hands, head control and ability to swallow), loss of vision, epileptic seizures, vomiting, irritability, and comas. The pattern in which the myelin is destroyed in VWM patients means that it primarily affects patients physically; cognitively they remain relatively unaffected. How do you get VWM Disease? VWM is a recessive genetic disease, meaning both parents carry a mutation on the same gene that has been inherited by their child. Each child of parents who carry VWM has a 25% chance of having VWM, a 50% chance of being a carrier, and a 25% of being unaffected. VWM is caused by a mutation on one of 5 EIF2B genes (EIF2B1, EIF2B2, EIF2B3, EIF2B4 and EIF2B5). The parent carriers must have a mutation on the same EIF2B gene for the child to inherit VWM. 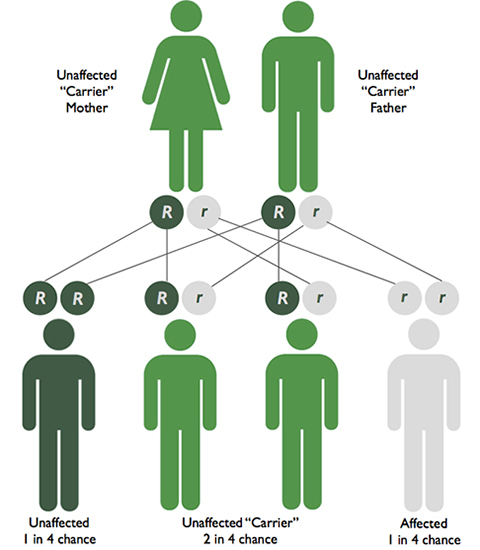 Though the mutation may occur on the same gene, each individual parent mutation is different, therefore each affected child has a unique pair of mutations. The combination of these two mutations determines the severity of the disease. For this reason, the severity of the disease is completely individual and depends on the combination of mutations each affected child has. Could other children in the family also have VWM? If both parents are carriers of VWM, each child has a 1 in 4 chance of being affected. To determine if other children in the family are affected by or carriers of VWM, it is best to consult with your genetic counselor or your child’s physician. VWM disease is diagnosed based on symptoms present along with results of an MRI of the brain. DNA testing is also done to confirm diagnosis. What are the different forms of VWM? The Antenatal form of VWM typically presents within the third trimester of pregnancy. Often, decreased fetal movement can be detected. Symptoms continue to present with unrelenting progression that has proven to lead to death with the first year of life. Some symptoms following birth could include but are not limited to feeding difficulties, vomiting, seizures, and apneaic episodes. The symptoms of the Infantile Onset form of VWM appear within the first year of life, with death occurring in the following months, generally before the age of two. Affected individuals commonly have symptoms such as low muscle tone, seizures, vomiting, rapid breathing, regression of milestones, loss of vision, and a lack of energy. Onset of the Early Childhood form of VWM occurs after a seemingly normal period of development. Most affected individuals typically become symptomatic between the ages of one and five years of age, showing signs such as difficulty walking and seizures. The prognosis varies for each individual with a wide range of outcomes from rapid progression and death between one and five years of age to a slower progression with death occurring several years following onset. Symptoms generally appear between the ages of five and 15 years of age in the Juvenile Onset of VWM. This form often progresses more slowly than the infantile and early childhood forms, resulting in a longer-term survival. Many affected individuals with the Juvenile Onset form experience long periods of stability, and in a few cases, have even demonstrated some improvements of motor function. In a few Juvenile Onset cases, however, a quick progression followed by death within a few months has also been reported. Unlike the other forms of VWM, the Adult Onset form most commonly presents with behavior problems as a result of cognitive decline rather than with neurological systems. Severe headaches can also be an initial symptom for this form. Is there a treatment for VWM? Although there is currently no cure for VWM, it is treatable. What research is being done to find treatments and a cure for VWM? The identification of the genetic basis of VWM has been a great step forward in research of the disease. This has allowed scientists to develop genetic methods of diagnosing VWM, which can lead to the possibility of genetic testing for the disease in the future. If you know that the disease runs in your family, you can talk to a genetic counselor about the option of prenatal testing, as well as testing of family members to find out if they are carriers of the disease. Dr. van der Knaap, pediatric neurologist at VU University Amsterdam and the VU University Medical Center, is at the forefront of VWM research. She was one of the first to identify the cause of VWM. Her research team continues to make good progress toward understanding VWM and how we may be able to treat it. ​Moreover, Dr. Orna Elroy-Stein, professor at the Department of Cell Research and Immunology at the Faculty of Life Sciences, Tel Aviv University, and a member of the Sagol School of Neuroscience, was the first to develop a VWM “mouse model” known as Marisol’s Mice. She is also making good progress toward better understanding VWM, and is working to identify potential drug treatments for VWM. Recently, Elroy-Stein’s team found potential drug matches at the molecular level with the next step being to test them on mouse models. Lastly, Joshua Bonkowsky, MD, PhD, Pediatric Neurologist from University of Utah, is using a novel small vertebrate model (zebrafish) to understand VWM and to discover new treatments. Zebrafish offer key benefits to circumvent research issues: myelin development occurs rapidly, the same genes control myelin development in zebrafish as in humans, and low costs and small size facilitate screening not possible in other systems. Because the VWM zebrafish rapidly develops disease, The Bonkowsky Lab is using them to screen for drugs and compounds that help prevent the disease. Thank you to Donna Skwirut for the content provided on this page.